Pre-designed and consistent patterns throughout. Uniqueness of an authentic wood is impossible to replicate. Texture and variation to wood grains. Can be harder to repair. 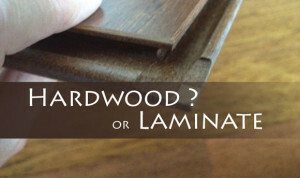 Laminate can not be sanded or refinished. Can be sanded, stained or refinished. Due to the uniqueness of wood, treatments can give the wood even more depth and texture. Durability: Climate and Animal friendly? Excellent, due to hard surface. Can withstand more heat, scratches, and fading. Perfect for heavy foot and animal traffic. Very good, depending on species and finish. However, a more soft product and is susceptible to denting and fluctuations based on moisture and temperature. Super Easy: Can sweep, use a dry mop, or damp cloth. Easy but should only use special hardwood flooring cleaners that are recommended by the manufacturer. Typically replaced within 15-20 years. Wear and tear will eventually set in as the flooring can not be sanded or refinished. Lifetime if maintained correctly. Since hardwood is typically easier to repair and replace. Less expensive and may be the most effective if you are looking for an imitation look without the price. You are paying more for the material, texture, and uniqueness while having a more upscale and luxurious look in the home.